Until a month ago, if you’d asked me what I thought of Korea, you’d have been met with pretty much a blank stare. Despite my car being a Hyundai and my phone being a Samsung, it really was a country I knew nothing about. 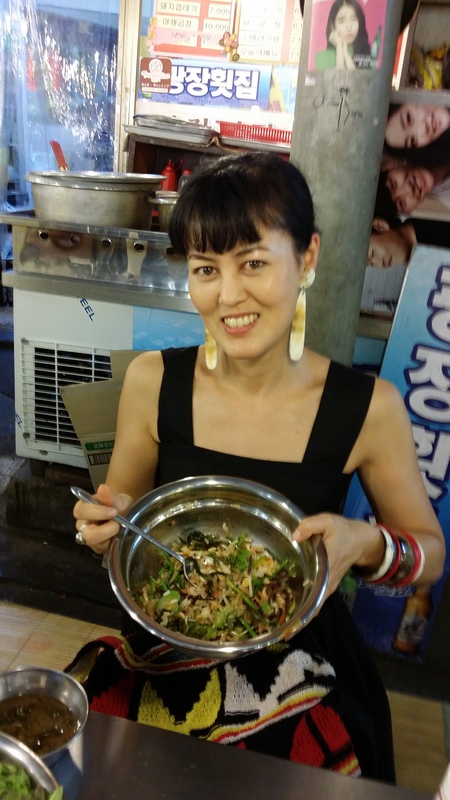 However, having to fly to Japan from Laos recently (tough gig, I know) meant I had to do a stopover somewhere (the countries which have direct flights to and from Laos are quite limited), so reluctantly decided on Seoul. Reluctantly, because the city had never been on my list of places to visit. 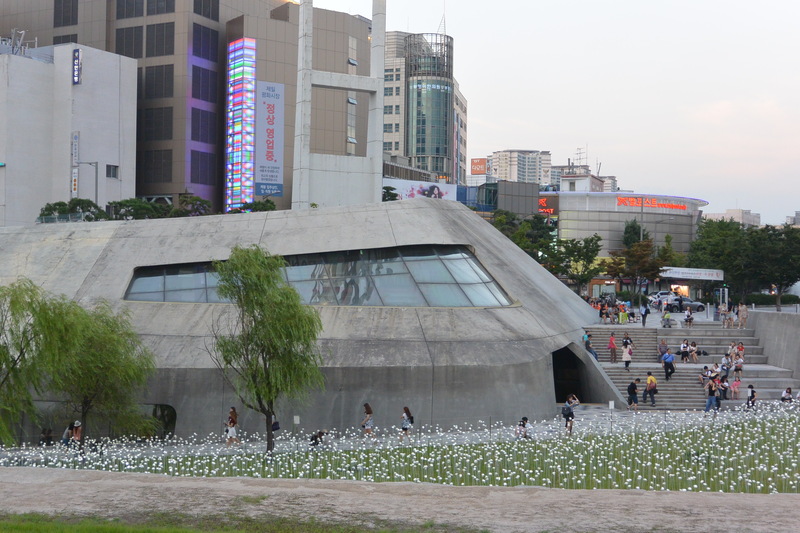 But it didn’t take long for me to be extremely pleasantly surprised – and to amass a LOT of photos and experiences, which I’ll break up into several posts, starting with today’s, which is all about seeing Seoul on the super-cheap. I arrived early in the morning after a night flight and after checking into my cheapo guesthouse which required contortionist skills just to take a shower without falling into the toilet* (which I suppose you could count as something like a free Pilates session), walked to not one but TWO flea markets. Yes, I booked my accommodation based on its proximity to secondhand rummaging after extensive research (read “fiendishly Googling Seoul flea markets”). The second flea market was a short walk towards Dongdaemun from Seoul Folk Flea Market and is also held every day – it’s especially worth going on weekends but there are stalls during the week too. It’s held around Dongmyo shrine and there are all kinds of cheap things on offer although secondhand clothes were probably the most popular. And – at this stall, anyway, silver shoes. LOTS of silver shoes. I was tempted by one of the few stalls selling secondhand traditional Korean clothing but as I had no knowledge of it decided to give it a miss – the things that were being sold were stiff, white simple kimono-style pieces that I had a feeling might actually be men’s underwear, and although that kind of thing doesn’t bother me I chose to save my won for future purchases. So, two flea markets down, my wallet was still (extremely unusually after viewing so much cheap secondhand stuff) basically untouched. 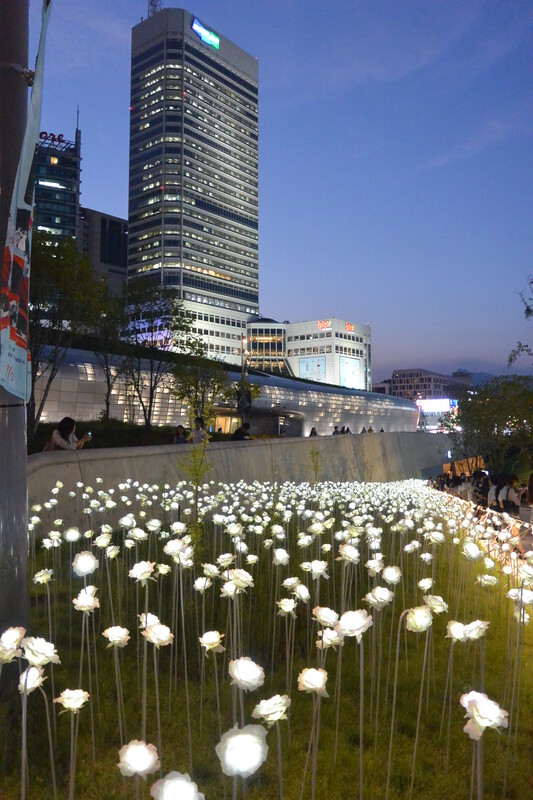 I think that’s the main reason Seoul put me in such a happy frame of mind – I enjoyed wandering around and looking at things so much that I didn’t need to actually spend any money to have a good time. 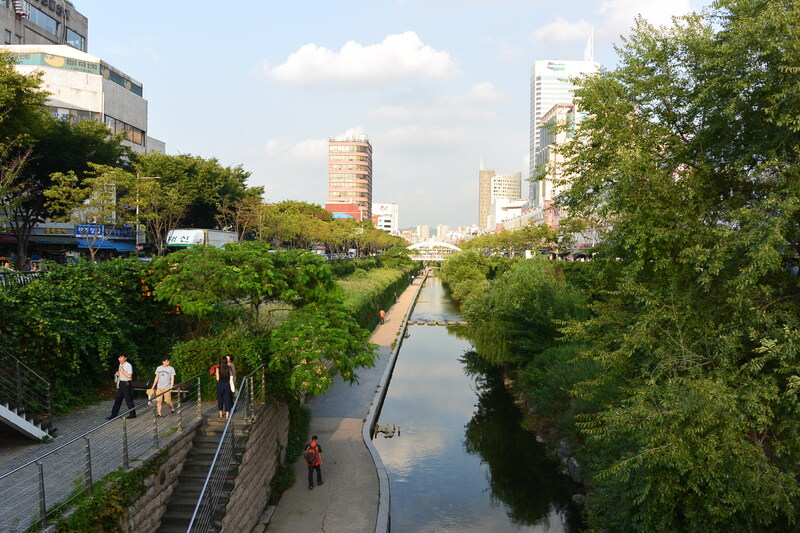 Plus, it’s really a beautiful city – check out this canal that runs along the side of the major haberdashery district, perfect for a stroll at any time of day, although evening is probably prettiest. 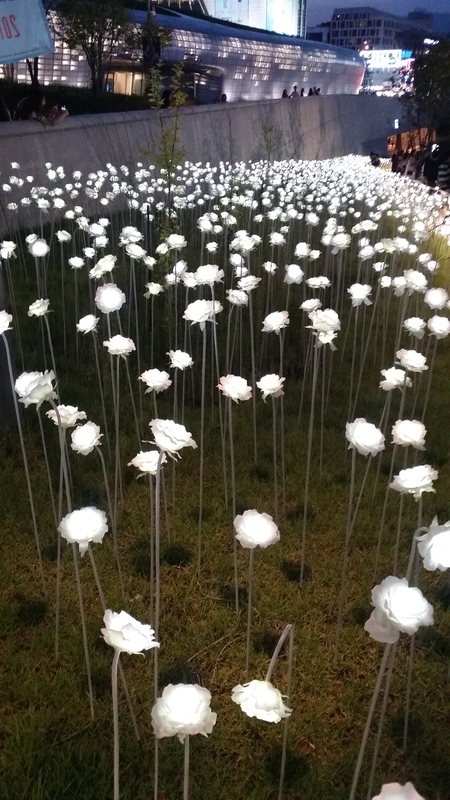 Evening is also a good time to head to Dongdaemun Design Plaza because it’s when the field of white LED roses is lit up… … and there is a little design market that sets up and food trucks selling cheap (5000 won! Or about $7?) 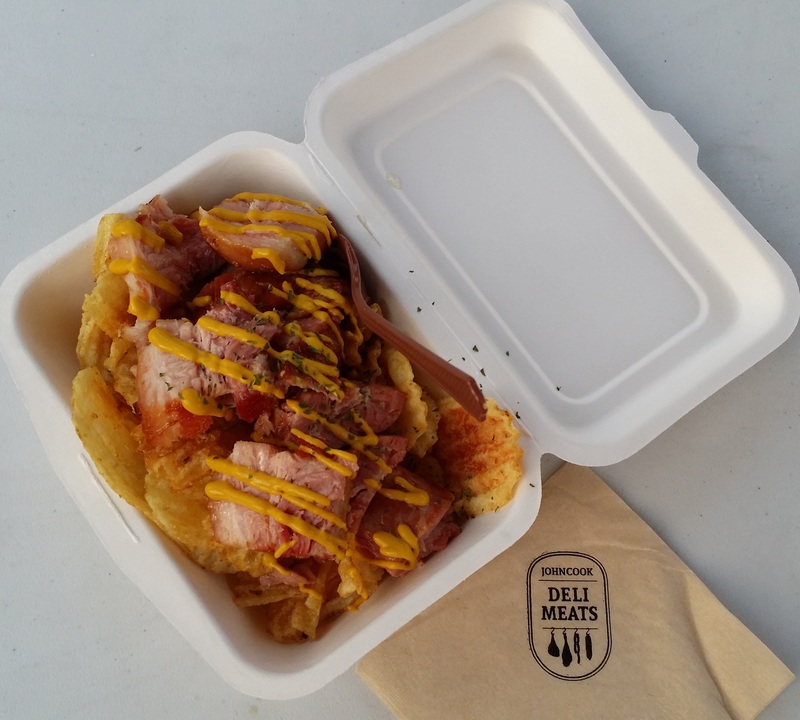 meals which were actually generous portion-wise, unlike many of the Melbourne food trucks! Hmm, maybe not the healthiest, but yum nevertheless, and a great accompaniment for people watching on a balmy summer’s evening. 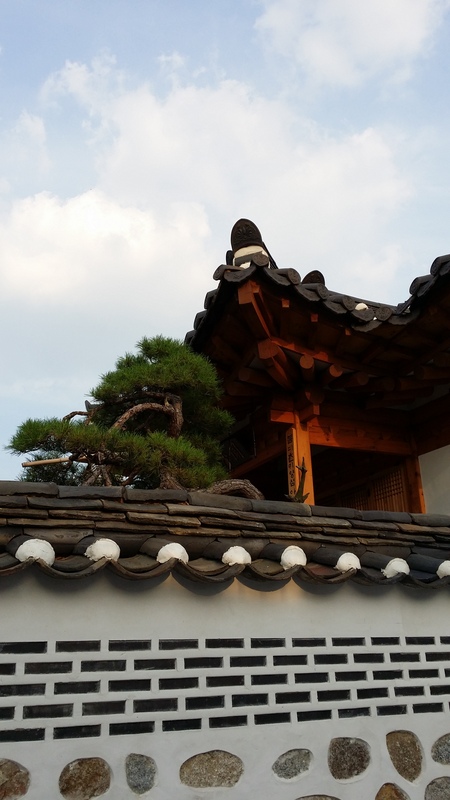 Another place that is great for just taking in the scenery is Bukchon, a hilly neighbourhood in the palace area where traditional houses remain, making it super photogenic, especially in the evening (watch out for local couples on dates, it’s a quite romantic spot with some lovely views!). I was there solo, but couldn’t have been happier wandering through the little alleys and just enjoying the atmosphere. There are lots of traditional arts and crafts workshops operating from houses in the area but I was too late to try any as they close at 6pm – the people running them kept calling me in to have a look around though. Super friendly! If you’re interested in learning how to tie ornamental knots or apply gold leaf to things or any similar traditional craft, I’d recommend wandering around in the morning so you can see what’s on offer, as I’m sure that not every workshop is mentioned in guidebooks, plus the programs change daily. Something that probably doesn’t change much every day but is nevertheless a must-see for textile lovers is the hanbok section of any Seoul market. I can’t remember which one this glamorous multi-tasking shop owner was at, but you won’t have to make much of an effort to find hanbok stores as there are whole lanes full of them even in Metro stations and many are open quite late at night. They’re probably quite expensive if you buy the good quality ones, but hey, looking is free! It’s free to look at all the food at Gwangjang Market too, but as if I was only going to feast my eyes! For 5000 won I got bibimbap and miso soup and cold tea, plus accoutrements that the lady kept loading into my bowl (Korean miso and other random toppings) and could help myself to dried fish, pickles and (of course) kimchi. No wonder I’m smiling! I’m totally sold on Seoul. *It definitely was NOT luxury accommodation such as I was lucky enough to experience recently. But I spent so little time there that it hardly mattered! Great post. You make me want to be back in South Korea. Amazing! Glad you liked it! More to come..